I never forgot her words. It turns out I don’t have a choice. I am pagan. It is in my blood, and in my soul. I always have been as long as I can remember. I still remember when I was young; my first memory is pretending my Disney books were spell books. When most kids were playing baseball I was hunting for “herbs” to make infusions out of. Of course I didn’t know anything about real herbs, so I gave all the weeds around my neighborhood their own names and correspondences as I saw fit (I would then sell the infusions by the side of the road. I guess there’s a bit of snake oil salesman in me as well. Who needs a lemonade stand?). But I can’t join in. I never did grow up to believe. One day I decided that even if I was the only one in the world who believed in the Old Gods, so be it. I informed my mother that I was never going to church again (and she was good enough to respect that and not make me). It was then that I opened my heart to Them. Imagine my joy and surprise years later to discover there where others who felt the same way! The fact is I love paganism. LOVE it. I love the smell of incense and the sight of candles on my shrines, flickering off the statues and my beloved devotional items. It brings me true peace. I love the herbs and scented oils. I love the people and the wide range of ideas and beliefs everyone brings to the table. I love the connection to the Earth and Gods that I feel when I give an offering with nothing other than love and devotion in my heart. I love the deep sense of reverence and being wrapped up in the divine I feel when I am in Their presence. My entire world is magical. I see evidence of the old gods everywhere and the nature spirits are all around me. In a world filled with interest rates and property taxes, I enjoy knowing that the world is not exactly as it presents itself and I am only a breath away from True Magic. 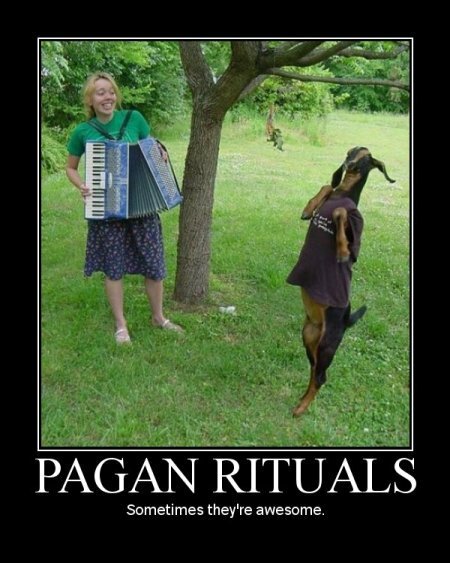 Not only do I love being pagan, I love other pagans as well! I love Witches, Druids, Reconstructionists, left-hand-pathers, you name it! I think you are all wonderful. You are my people, even if we disagree on various points I feel a bond with you. I raise my drinking glass to you. However my co-round-tabler was right. Paganism is hard work. I’m currently trying to find exactly where I fit in the pagan spectrum, and let me tell you all that introspection begins to hurt after awhile. There is so much conflicting information! If you do practice A, you get labeled as “fluffy” (and no one wants to be fluffy! Ack!). Yet if you except that if you do A, you must do B, C, and D as well you feel constrained. The “Your doing it wrong” police are on the prowl, on the look out for ways that they can criticize other peoples practices and bring us all into the fold of The One Right Pagan Way. I shudder at the implications. It’s enough to make any curious seeker take one look at us and run for the hills. Even an old hat like myself feels intimidated and is constantly looking over his shoulder. Which brings me to my current conundrum. Exactly what kind of pagan am I anyway? What do I believe? I’ve been asking myself this my entire life. My path has taken on many twists and turns. In the end I decided to walk the path as a Hedge Druid, though I incorporate Sorcery into my work quite a bit. Hi, yours is probably the best “About” I have read in a very long time. I know your pain when it comes to not knowing what path your walking and that you only know that your walking the right one because you have been walking it since you can remember. That is me, I have been studying Wicca and Witchcraft for nearly 20 years now and still dont know what path I walk although I know that it is the Celtic Gods that are calling my name. Over the last month or so I have turned away from Wicca, I dont know there are some things that just dont tick the right boxes for me. I have always been fascinated by clouds and the sky, I love the sea and like you I feel safe and at home when Im in wooded areas. Am I a Druid? I will let you know when i know 🙂 as I have only recently started seriously looking into Druidry. Oh I have pinched your Stag and moon symbol for my blog over at Nosceres World I hope you dont mind. Hi Jim, thanks for the kind words! I feel your pain in realizing that the path you have walked for years may not suit you any more. i wish you luck in finding that true path wherever it may lead! Oh and I stole the stand and moon symbol from the internet too, it’s not mine originally! I have no idea who made it, but I do like it! The best ‘About’ ive read since last time. blessings from a german seapriestess and witch. I agree with everything you say, I rely on my devotion to mother nature and tree spirits to lift my heart, and they never fail!! In my garden or the beautiful downland of Wiltshire where I live , nearer my God I am to thee , God is mother nature, and mother nature is God.